Since 1980, Peter J McDonald Engineering Ltd has been supplying a top quality service to a large customer base and for this month’s edition of Irish Tractor, we profile the family run business to see what has made them so successful over the past four decades. From Livestock Buildings, Sheep Sheds, Straw Barns and Grain Stores to Chicken Sheds, Silage Clamps and General Purpose, Peter J McDonald Engineering Ltd can create a variety of agricultural farm buildings you want, at a great price. They can also manufacture extensions to your existing farm building, such as lean-to’s and side apex extensions. With a strong family history of farming, they understand the current challenges facing the agricultural industry. As such, they work hard to produce high-quality agricultural buildings at competitive prices. The New Ross, Co Wexford based company has the capability in-house to carry out work from the supply of a basic steel-frame building, to a complete design & build package, for a variety of uses from livestock housing to crop storage. Sales manager Enda McDonald spoke to us about the services that they provide. “We can fabricate any type or size of building including lean-to’s and side, or end extensions. For extensions, or buildings out of level, site visits can be carried out if required, prior to manufacture,” said Enda. The company has achieved compliance with the requirements of I.S. EN1090-1:2009+A1:2011 for CE marking of Structural Steel up to Execution Class 2 (EXC 2), which covers the fabrication of most of the structural steel used in Ireland and the UK. In addition to a dedicated management team, with the backing of a quality appraised sub-contracting and material supply chain support network. Bespoke structural steel/cladding requirements are provided through the in-house manufacturing facility. McDonald Engineering have supplied and erected buildings for some of the largest farming operations in the country and not only can they offer a full building solution, they can supply all of the internal fittings and equipment. Not only do they design and manufacture all of their own equipment, they are able to provide a full fitting and installation service and undertake any additional works, which hasn’t been seen before in the industry. During the recession, the company diversified their services slightly when they started manufacturing cubicle shelters for calves, donkeys, pigs and lambs and it is a section of the business that has really taken off since then. “We sell the cubicles direct to farmers usually through done deal and they have proven very popular as we sell them all across Ireland and the U.K.
Enda revealed that they have seen a change in the trend of design of agricultural buildings as more farmers are returning to the round roof look. “Curved or more commonly known round roofs have been a feature of the agricultural country side for the 20th century. They are a cheap and economical method of providing practical livestock and fodder housing for the practical farmer. These high eve buildings provide excellent room for storage of agricultural machinery and hay and straw bales. Many Farmer require customised feeding rails and holding pens designed and fabricated specifically for their farm. 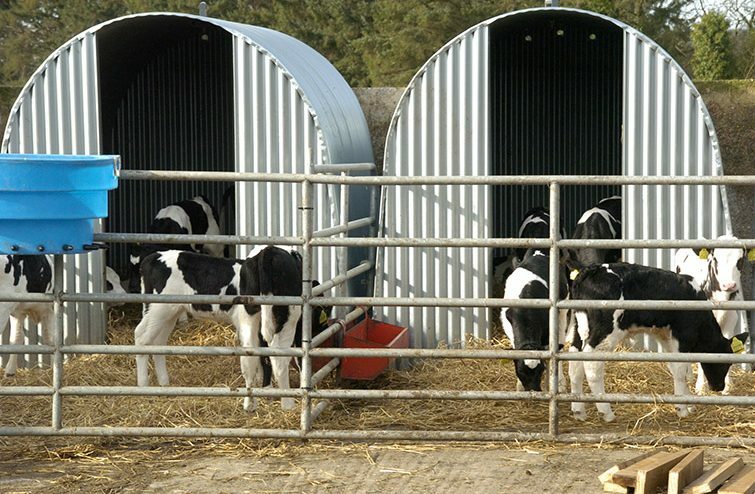 Cubicles, barriers and gates can be fabricated to enable the safe and hygienic housing of livestock. As stated, the company can carry out any type of steel fabrication as they commonly manufacture steel Balconies which are made to measure, internal steel stairs, external fire escapes and emergency steel exit doors are amongst some of the many steel based infrastructures carried out by the company. Steel frame supports and floor decking etc.. have been fitted into customer sites to support concrete floors, air conditioning units and many more vital infrastructures that are crucial to your business. Of course, in order to carry out this work, the business has all the necessary accreditation needed to do so.